The LDP is using its position as Japan’s governing party to make life difficult for Okinawa’s new anti-base governor. While the world focuses its attention on the impact the hostage crisis in the Middle East will have on Japanese Prime Minister Shinzo Abe’s attempts to prepare Japan for a more active security role in the world, nascent trouble is brewing much closer to the home islands. Ever since the anti-base candidate won the gubernatorial race in Okinawa, relations between the Liberal Democratic Party (LDP)-controlled central government and the Ryukyu Islands have been contentious, to put it mildly. The LDP has reacted to the indigenous anti-base movement by slashing special funding for Okinawa, snubbing the newly elected governor during his trips to Tokyo, and proceeding with the relocation plans despite popular protests. Takashi Onaga was elected governor of Okinawa on November 16, toppling the LDP-backed incumbent, Hirokazu Nakaima. Nakaima had supported Tokyo’s agreement with the U.S. to relocate the U.S. Marine Corps Air Station Futenma in Ginowan to the Henoko district of the city of Nago. Meanwhile, Onaga ran on an anti-base platform: he and his supporters believe that the burden of maintaining U.S. forces should be distributed more evenly throughout Japan. His victory, as well as the victory of all four candidates who opposed the relocation plan in the December 14 Lower House snap election, sends a loud and clear signal that Okinawans oppose the central government’s plan for their prefecture. The LDP has used its structural advantage as the ruling party in the central government to respond swiftly and punitively. The special budget for Okinawa promotion has been slashed. In 2013, Abe’s government had earmarked 350.2 billion yen (about $2.9 billion) in its budget for the promotion of Okinawa in fiscal year 2014. This was even greater than the amount the office in charge of Okinawa promotion had requested. The government even went as far as to promise more than 300 billion yen every year until fiscal 2021. While this pledge has been upheld, the decrease to 334 billion yen in grants for fiscal 2015 – less than the 379.4 billion yen requested by the responsible Cabinet Office – is a telltale sign of LDP displeasure. 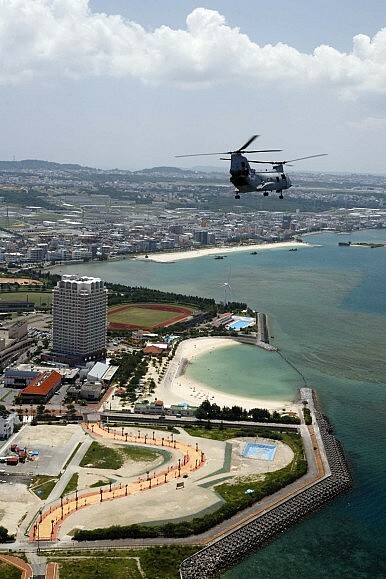 It is the first time in five years that subsidies for Okinawa have been reduced. These special subsidies, applied only to Okinawa, had been steadily increasing since 2010 (when Okinawa received 229.8 billion yen) in order to ameliorate local anger toward the U.S. military presence. Now Tokyo appears to have given up on buying off the Okinawans. The government’s shifting priority can be clearly seen in its decision to more than double the amount of money set aside in fiscal year 2015 for the Futenma relocation plan. Onaga has also been snubbed on multiple occasions while trying to make overtures to the central government to discuss the base issue, as well as other issues important to the prefecture. When Onaga made a courtesy call to Tokyo in December, he was unable to meet most of the officials he requested meetings with, and could only meet with Shunichi Yamaguchi, the state minster in charge of Okinawa promotion. During his trip to Tokyo from January 6 to 8, he was not welcomed to the meeting to discuss the government’s budget for fiscal year 2015, and his request for a meeting with the agriculture minister Koya Nishikawa to discuss the central government’s grant for sugar cane was ignored. The only meeting he was able to attend was the National Governors’ Association meeting. Onaga went to Tokyo again on January 14 specifically to discuss the base issue, but was denied a meeting with Chief Cabinet Secretary Yoshihide Suga. Onaga met with Deputy Chief Cabinet Secretary Kazuhiro Sugita instead. Numerous LDP officials have made blatant remarks about refusing to meet Onaga because of his position on the base issue. One way that the LDP may try to alienate him even further is by requiring him to coordinate meeting requests through the LDP’s prefectural office. This in stark contrast to former Governor Nakaima, who coordinated talks directly with the government officials. On the ground in Okinawa, protesters clashed with authorities on January 14 over the transfer of heavy machinery to the U.S. Marine Corps’ Camp Schwab, and again on January 15 as installation work began for a floating pier necessary for a drilling survey. The Japanese Coast Guard forcibly removed 19 protesters in kayaks from the water, while riot police clashed with more conventional opponents. In Tokyo, protesters encircled the Diet on January 25 until police removed them. Organizers of the protest, including pacifist groups, report that 7,000 people participated. A day later, Onaga pledged to convene a panel of experts to examine Nakaima’s approval for the landfill project in December 2013, and stated, “If the panel judges that the authorization has flaws, then I’d respect that conclusion as much as possible.” He continued, “Even if there are no flaws, my policy of not allowing a new base to be built in the Henoko district won’t change and I’d like to think about what to do.” On the same day, Okinawan Vice Governor Mitsuo Ageda visited the Defense Ministry’s Okinawa Defense Bureau in Kadena to meet with Director-General Kazunori Inoue and formally request the relocation work be temporarily suspended. No one doubts that it is a good idea for Okinawan residents to close the base at Ginowan. But Abe’s promise to “[obtain] understanding from residents” sounds hollow when Abe and his party refuse to even meet with the people’s democratically and legitimately elected governor. The people had several opportunities to make a choice – with the November gubernatorial election and the December snap election – and the five-to-zero score for anti-base candidates leaves no ambiguity about what the people want. States do sometimes require sacrifices by their people in their pursuit of security; however, shutting down debate by refusing to even meet with the representative of dissenting opinions is not the way a democracy should comport itself. Going forward, stay tuned to the outcome of Onaga’s special panel and other tactics Onaga might try, such as forestalling or at least suspending construction on the grounds of environmental concerns.